This summer Princess Cruises will be expanding to two new homeports in China, meaning the line will have three homeports in the market in three years. To support the expanded home ports and itineraries, Princess is positioning itself in China as the Global Travel Master. The first tool in that positioning is a new mini-movie that will be used in Princess' advertising and features celebrity couple (in China) Emma Pei and Rojamtic Wang. A video of the mini-movie is below. Note the extremely high quality of the production throughout. "Where's the Princess?" - 2016 Princess China Brand Film from Dave deMerlier on Vimeo. When Carnival Vista enters service in May, it will have a new attraction that will send passengers whizzing around the ship’s top deck at speeds up to 25 miles per hour on an 800-foot track. The SkyRide is something like a bicycle suspended from a track above, and it was created by the same guy who invented Rollerblades. In thus new video from Carnival, you'll see the prototype on land and then go aboard the ship, under construction in Italy, to see where it will eventually be installed. Everybody knows that Australia’s cruise market is growing by leaps and bounds (and CLIA has the figures to prove it), but they could be even bigger right now if they just had the capacity in their ports - especially Sydney - to handle more and larger ships. A new CLIA study shows the lost opportunity is almost twice the amount the industry is currently contributing to the Australian economy. The complete story appeared in the February 25 edition of Cruise News Daily. Not everyone is rushing to China. Last fall we told Carnival Cruise Line said they would send one ship to China in the spring of 2017 and a second one in the spring of 2018. Carnival has rethought their schedule and decided to delay everything by a year, with the first ship, Carnival Miracle, now going in the spring of 2018 and Carnival Splendor going a year later. Last week we noted that when Houston’s current two tenants at its Bayport Cruise Terminal leave in the spring, the port has decided not to continue trying to market the facility and is apparently giving up on their long-running efforts to find cruise ships to sail from the facility. In coming to that decision, we said one factor could well have been the realization that there is a shortage of ships in North America caused by lines sending ship after ship to Australia and China where yields are much higher. Meyer Werft cutting the first steel for the second ship for Genting's Dream Cruises brand. When Royal Caribbean International says they are "Autism Friendly," they mean it. The complete stories appeared in the February 24 edition of Cruise News Daily. With all the stuff going on in the world, you probably haven’t missed it, but Carnival Magic has dropped out of sight this week (and next). The ship is undergoing a refit before it’s redeployed to Port Canaveral at the end of April. With the competition heating up at the Central Florida port, Carnival is upping their game both by bringing in Carnival Magic, and also by adding a number of their newest dining options to the ship. The “Remastered” Queen Mary 2 will leave New York on a special Independence Day cruise on July 1, so passengers will miss the spectacular New York City fireworks on the Fourth of July. But those are nothing compared to the fireworks which often erupt from the two guest speakers which will be aboard for the Cunard Insights program. For this special sailing, Cunard has booked the husband and wife team of political commentators Mary Matalin and James Carville, who have completely opposite political perspectives. The Port of Rotterdam is proudly pointing out that this spring they will have three giant newbuilds call at the port fresh from the yard. In April, the port will play host to Royal Caribbean’s Ovation of the Seas. In May, her big sister, Harmony of the Seas, visits. Also in May, AIDA’s long-delayed megaliner, AIDAprima will homeport at Rotterdam for a series of cruises. Carnival Fantasy is experiencing a technical problem that’s limiting its cruising speed, and that has necessitated a major itinerary change, and that will keep it from getting to Cozumel in time for its scheduled Carnival Live concert by Kathy Griffin. 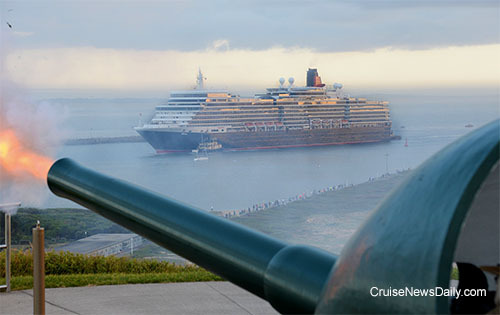 Cunard’s Queen Elizabeth arrived at Newcastle this morning for the first time as part of her 121-day world voyage. The occasion was marked by a three-gun salute from an artillery piece in place at the city's historic Fort Scratchley. Photo copyright James Morgan. All rights reserved. May not be copied or used without permission.